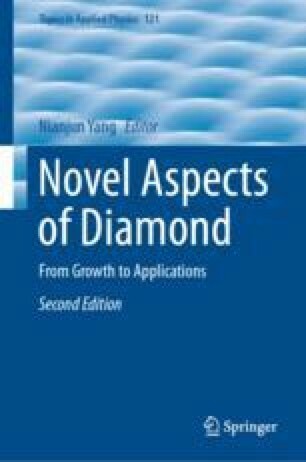 This chapter reviews the construction, modification, and physical characteristics of two types of diamond electrodes: nanoparticle-modified diamond electrodes (NMDE) and detonation nanodiamond-based electrodes (DNDE). These particular types of diamond electrodes show great promise for improving the performance of diamond electrodes via the incorporation of nano-scale chemistry at their surfaces. The construction of both types of electrodes is reviewed, along with the resultant physical and electronic effects. The methods reviewed here are particularly applicable for electroanalytical and electrocatalytic applications of nanoparticle-based diamond electrodes. A brief review of progress on the interactions between metals and diamond at nanoparticle-based electrodes is also included. Finally, an outline of the present state-of-the art research in this field is presented.